The lifetime of children born in 1958 still has some time to run. That’s what you take from yet another failed alarmist prediction? You lefties are soooo entertaining. TOM Gator I know reading comprehension isn’t your strong point. Given US life expectancy is ~78 years that leaves a few years still to go before the prediction comes to pass. And yet, you still believe the alarmists, even though every one of their predictions has been wrong. You lefties are just precious! There is one coming in 2019… I hope you are prepared!!! So you are saying a few more years yet before they have to move the goal posts yet again. When the article was written average life expectancy was considerably less than it is now. In 1950 for the Americas it was 58.4 years and globally only 48 years. Comprehension is not a word you even comprehend. !! You would have to be the DUMBEST AGW CRETIN on the planet. !! Ignorance is your DESTINY !! Phil- once again you are shitting around with pseudo arguments. Life expectancy 60 years ago was in average 10 years lower than it is now. When the article was written it was 66 for males and 73 for females for the US. For some reason, judging by the title of this thread, Tony thinks it predicted 60 years of ice free arctic by now! I thought about it some more and have to agree with Phil here. The record for longevity is supposedly a 160 years. So that pushes the date out the 2118, because we ought to be absolutely sure that no one is still alive from 1958. And then in the Bible there were folks like Enoch who lived to 430 years and even longer. So, it is possible that the author was a fundamental Christian literalist (not likely, but possible), so that would push the date out to 2388. And if we were talking Methuselah the date would be 2927. But as most ordinary folks don’t think this way, we can see why the CAGW campaign is falling on deaf ears. But, but, but… the model!!! Phil’s right. Many people who were children in 1958 are still alive (and I think you once said you were born in 1957, Tony), so it’s still possible that the Arctic could become ice-free in their lifetimes. What part of, your ilk have been failing at climate predictions for a lifetime, is it that you do you not understand? So, I get it that 60 years isn’t long enough for you – that a lifetime is longer. So, let’s see if you can be pleased. Would you like for Tony to re-post failed predictions from 70 years ago? Or 80 years ago? You name the lifetime age. Salivating dogs don’t think things through very carefully. Would you like for Tony to re-post failed predictions from 70 years ago? Or 80 years ago? You name the lifetime age. Personally I hope that it’s rather more than 78 years, my pension company and SSA seem to think it is. The point is that he posted a prediction that has not yet failed and gave a rather strange title to the post which implied that he didn’t understand the prediction “Celebrating Sixty Years Of Ice-Free Arctic”. White males born in 1960 had a life expectancy at birth of 67 years (females 74). To date, over the past 60 years, it has failed. There is essentially no chance that it will come to pass. How much was their life span shortened by the fact that they had to endure the “coming ice age” for the first 20 years? Some of the “experts” that predicted an ice age are still with us as well! Phil is right, sixty years so far, but children are still living from 1958. Sadly, very few people read old poetry these days, but I am reminded of something by Oliver Wendell Holmes, the poem “The Wondeful One Hoss Shay”. Apparently, the Arctic icecap is the modern equivalent of the wonderful shay. It goes on and on and on, year after year with no appreciable change, until one day… WHAM! Thermodynamics be damned, it all falls to nothing in a moment! I could pick nits like Phil and say that many children alive sixty years ago are now long dead. And many more die each year. So the author was wrong. 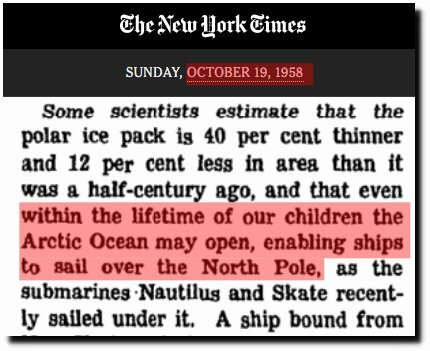 Not all of “our” children that were alive in 1958 may live to see an ice free Arctic. Maybe even none. I was born in 1955. My class in HS was just over 500. Over half of them are dead now. Really? That’s surprising, I was born in ’49 and my HS class is no where near 50% as yet. You are one of the most gullible twerps I have ever had the pleasure to laugh at. Maman… It was ice free in summer for much of the first 9000+ years of the current interglacial. We live in a very anomalously time in the Holocene..
A time when Arctic sea ice is still in the top 10% of the last 10,000 years. A time only just a small bump out of the coldest period in 10,000 years. 20 years ago NASA was saying that the average global temperature was 15°C, today their figures say that it’s 14.9°C. This drop in temperature over the last 20 years is in the midst of apparently relentless global warming and the many retrospective upward temperature adjustments for the period. “According to GISS, the global mean surface air temperature for that period was estimated to be 57 F (14 C). That would put the planet’s average surface temperature in 2017 at 58.62 F (14.9 C)”. In fact in the late 1800’s and then again in 1906, Arrhenius said the temperature was 15C. One of the ubiquitous CAGW/Climate Change modifiers. Never a WILL writ large by the prophets of doom; At least not since Erlich’s epic failure. And then there is “…lifetime of our children..”? Very specific, huh? I have lived through Erhlich’s gloomy prophesies (wrong but at least specific) along with Y2K and recall that in the early ’90s there were medical “experts” predicting that AIDS COULD wipe us out. I won’t bother to list AGore’s nor Hansen’s failed forecasts. My area is currently flooding in the new normal of endless drought predicted by Hayhoe and others – with more “drought”on the way. Now, during a current break in the drought, I gotta slug through my muddy garden. When I became disillusioned, I thought all I had to do was show the facts to my friends and they would see what I saw. Boy did I find out differently. More disillusionment. AGW believers have a special kind of blindness, caused by politics, peer pressure and shame. It’s a religious belief. It’s everything that honest science is not. I have a cousin who is married to an old white man. She recently said she will only vote for a woman candidate, regardless of her beliefs, because old white men are what is ruining this country. I wonder if she has any idea that she is an ageist racist sexist? Or, whether she has any idea of the irony that she just said she is married to what she said is ruining this country. Hey Gator. No. The answer is “no”, she has no idea, and nothing you or I could possibly tell her would change her mind. FYI, I have relatives just as bad. That’s an amazing list, Gator. And at the time, 1970, the biggest advancements in pollution control were being implemented, the Environmental Protection Agency was formed, sewage treatment was being elevated to ‘secondary’ treatment all across the U.S., scrubbers/precipitators/filters were being installed on all smokestacks, nuclear power plants were being constructed left and right, etc. All their dire predictions were about 20-30 years behind the times. Just like Marx, who spent his entire working life in the British Library and never got out and saw the improvements which were gradually being implemented. We conducted a validation test of the IPCC forecasts based on the assumption that there would be no interventions. This test found that the errors for IPCC model long-term forecasts (91 to 100 years in the future) were 12.6 times larger than those from an evidence-based “no change” model. Based on our analyses, we concluded that the global warming alarm is an anti-scientific political movement. We then turned to the “structured analogies” method to forecast the likely outcomes of this movement. In this ongoing study, we have, to date, identified 26 historical alarmist movements. None of the forecasts for the analogous alarms proved correct. In the 25 alarms that called for government intervention, the government impost regulations in 23. None of the 23 interventions was effective and harm was caused by 20 of them. So not only are alarmists consistently wrong, but because of their agenda and ignorance, they are actually doing harm. My local meteorologist reported that North America had the highest area of snow cover for the date today. I’ll have to see if I can look that up later, I’m working off my iPhone on a poor signal right now. Anyone else please feel free to fact check my weather man, I’m curious to know if what he said is correct. According to Rutgers september 2018 was #1 so that seems likely, I think their data includes Greenland. Ms Griff, Alaska is part of North America. Well, apparently they are having an EMERGENCY meeting in Ottawa to deal with the urgent IPCC report. I think Barbie said the Arctic has melted or something like that. The BS goes on and on. Even if that were true, the ice saw a massive expansion that ended in 1979. When did we start pumping large amounts of CO2 into the atmosphere? And why do you hate poor brown people and Griff? And the griffstir makes up CRAP yet again !! LYING, DECEITFUL little worm that he is. Neurosis comes in many flavors, but the AGE hoax has left a terrible taste for many that do not suffer from the malady. The magical temperature control knob of man-made C02 is more akin to the human thought process control rheostat. Since this particular interglacial period will come to an end like all others, it is a wonder that the rabid left doesn’t mind the mass loss of life that will follow, human and animal. If the left and those that have been easily duped truly believe that AGW is the prime driver of troposheric temperature and care about their fellow human beings, they’d be calling for “Drill Baby Drill” and “Burn Baby Burn”. As we know, the end of this interglacial period will bring misery and mass death, and could it be that this would be looked at as a good thing?